The recent discovery of a seventeenth-century lantern clock by Thomas Langley of Abingdon, formerly in Berkshire but now in Oxfordshire, the first and only clock to be so far recorded by him, caused me to attempt to enquire into his background. But nothing in horological genealogy is ever as straightforward as we might hope. Abingdon had been a centre of religious nonconformity for generations, and Langley, like many of his fellow clockmakers in that area, was a nonconformist. Unfortunately the records of many religiously-outlawed nonconformists at this time are conspicuous by their absence, which means that most searches we make draw a blank. It never ceases to amaze me what efforts bigots will make to prevent others from indulging in their own individual forms of worship, however eccentric. I cannot fathom the niceties of belief that can make one religious group hate another in the name of Christian charity because they worship the same God differently, and can only set out the position as I grasp it. In the seventeenth century people took such things seriously and nonconformists were outlawed and persecuted. It follows that few kept records of their ceremonies, as that would have provided ammunition for their persecutors. The law obliged all citizens to attend the conformist church, which meant that some nonconformists did attend, at least some of the time, to disguise their nonconformity or to avoid fines, or both. To hold these religious opinions openly one had to be able to afford the fine and so nonconformists were mostly prosperous tradesmen or from the upper classes. This means we may sometimes find nonconformist events recorded in conformist registers, sometimes in non-conformist records, or often in no records at all. 1. This lantern clock is signed 'Tho. Langley Abingdon' and dates from the late 1680s. It is of the centre verge pendulum type and originally had alarmwork, since removed. One group of nonconformists were the Anabaptists, who, as I understand it, believed a person should be baptised as an adult when he was able to form his own opinion, not as an infant, who could hold none. The nearby village of Longworth is reputedly the oldest Anabaptist centre in England, where it is said there were adherents from the thirteenth century. One seventeenth-century report from churchwardens read: 'The greatest part of them are Anabaptists And most part of theire Children are yet unbaptized Although some of them above Ten years of age'. The first pastor of Longworth was John Pendarvis, B.A., born in 1622. By 1646 he was Vicar of St. Helen's in Abingdon (which parish then included Longworth) where he was for some years, certainly till after 1659. Pendarvis seems to have changed his beliefs several times but finally became an Anabaptist and preached widely up and down the country. In 1642 the Royalist army occupied Oxford, from which time the king had his headquarters there, yet throughout the Civil War there was a Parliamentarian garrison only about five miles away at Abingdon. By 1646 the king was losing the war and was forced to flee in disguise and Oxford eventually surrendered to a parliamentary army that year. A Baptist group was probably established in Oxford shortly after the surrender of the royalist garrison in 1646. Some of the councillors restored in that year were known Anabaptists. Cromwell's army included many fervent dissenters of varying denomination and no doubt the occupation of Oxford by the Model Army was an influence behind the fact that from 1646 to 1660 a strong Baptist church was developing there. The early Oxford Baptists were closely associated with the larger and much older Baptist church in Abingdon. In 1654, John Camm and John Audland, both itinerant Quakers, attended Baptist meetings when they visited Oxford, where they were given a welcome by James Jennings and Richard Quelch, the butler and porter of New College. 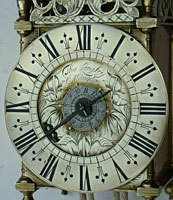 Richard Quelch was also a member of a clockmaking family to which Thomas Langley was apprenticed. Associated with the early Anabaptists was a group of 'Fifth Monarchy' men, of whom Richard Quelch, the Oxford watchmaker, was agent for Oxford in 1657. We know this must have been clockmaker Richard Quelch junior, as his father, clockmaker Richard senior, had died five years earlier, in 1652. I understand that the Fifth Monarchists believed that the timing of the events of the Civil War was significant because they identified the approaching year 1666 with the number 666, which was the Biblical 'number of the Beast'. It seems it had been predicted in the Book of Revelation that it was in such a year that the last human despot's kingly rule on earth would be replaced by the second coming of Jesus, who would reign for a thousand years, thereby establishing what they called the Fifth Monarchy. In 1634 the vicar of Abingdon was reported as 'a great disturber of the peace' for publishing strange doctrines'.... 'he has lately presumed in his preaching to venture upon state business and ... has denied the king's supremacy... '. The King was generally believed to rule by divine right, but Fifth Monarchy men denied this. A group of strongly anti-royalist Anabaptists and Fifth Monarchy Men, was established at Oxford shortly after the surrender of the Royalist troops in 1646. In 1657 too a prominent anti-royalist preached at All Saints church in Oxford, and we know this was the church the Quelch family attended. Just what bearing his political and religious views might have had on his clock and watch making, we cannot say, but it might be significant that no work is recorded today by Richard Quelch junior compared with a reasonable amount for his brother, John, to whom Thomas Langley was apprenticed. 2. The dial design is based on Parrot tulips rising from a central flower above VI, a style which began in London in the 1660s, but continued for some years, especially in the provinces. The dot by the I numeral is a hole which once carried the front pivot of the alarm trip. Nonconformists had a long history in clockmaking in and close to Abingdon. London clockmaker brothers William and John Selwood were born in 1607 and 1613 respectively in a village near Abingdon. Clockmaking brothers Edward and Joseph Norris were born at Abingdon in 1637 and 1649 respectively. They too were nonconformists. Edward was apprenticed to the Selwoods, then worked in London till he died in about 1707. Joseph trained under his older brother, Edward, then went to Amsterdam with Ahasuerus Fromanteel about 1668 and became famous as the first English clockmaker there, returning to Abingdon about 1692, where he died in 1727. The Anabaptists were a sect to which Ahasuerus Fromanteel himself and several of his associates were accused of belonging about this time. We know this is true, and we know Fromanteel and his son-in-law, Thomas Loomes, supported Cromwell, financially and in other ways. Thomas Loomes was part of the Selwood-Norris-Fromanteel group of Lothbury clockmakers who seem to have all been anti-Royalists. The Anabaptists at that time would have had no meeting house. They usually met either in the preacher's own home or in the large farm houses of the district, in some of which secret hiding places could conceal their minister, much as the Catholic 'priest holes' did later. After the restoration of 1660, and the Act of Uniformity of 1662, there followed a time of persecution for Nonconformists of all kinds. Nonconformists could not bury their dead in consecrated ground and traditionally they were buried in unconsecrated ground in a Church-yard or often outside the churchyard wall. There is a story of one churchyard on the locality, where a wooden roller was set into the wall top to make it easier to roll coffins over. The northern part of the yard is said to have been traditionally left for Nonconformists, Suicides and Murderers. Such was the hostility to nonconformists burying within churchyards that on one occasion certain Quaker coffin bearers were jostled by malcontents in the congregation to the point where the coffin was dropped and the body rolled out into the path. 3. This view of the movement from the left shows the divided trains with the verge pendulum hanging between. Note this has a conventional pear-shaped bob ( chamfered slightly front and back for greater clearance) not a bob of the anchor flukes type. The doors too are solid, with no cutouts as the pendulum swings within the span of the doors and required no projecting space beyond the plates. It may be for such reasons that Nonconformists are known to have been buried in orchards and gardens. At Longworth in1669 the rector reported that Anabaptist meetings were held in the house of one Thomas Jones, 'His hop garden theire Burying Place. In the unused part of the garden Thomas grew his hops'. The Abingdon Baptists first used an orchard for burial purposes, until they obtained a piece of land in Ock Street (Oak Street), which became the centre of nonconformity in Abingdon. The Baptists, Quakers and Independents all established meeting-houses there during the seventeenth century, and it was in that street that nonconformist clockmaker Joseph Norris set up when returning to his home town in 1692. Thomas Langley, the clockmaker, was born about 1658, son of Thomas Langley mercer of Stanford, Berkshire. In January 1637/38 his father, Thomas Langley(son of Henry Langley of Abingdon, maltster), had himself been apprenticed in the Fishmongers' Company of London to Samuel Cooper. In 1662 clockmaker John Wise was at Abingdon when his son, John, was apprenticed in London through the Fishmongers' Company; in 1664 he was named as a nonconformist there. The companies that boys were trained through were usually those where the family had earlier connections and in no way reflected the nature of the trades they pursued. Here again are connections between the nonconformist clockmakers of Abingdon and London. Were the Langley and Wise families related? Thomas Langley the clockmaker was apprenticed in April1673(from 24th June 1672) to John Quelch, the Oxford watchmaker, till 1681. John Quelch was the brother and former apprentice of Richard Quelch junior, the fervid nonconformist and known Fifth Monarchy man, who had recently died in1670. It seems the Langley family was related to the Quelches, as there was an Agnes Langley, who died at Abingdon in the 1570s, and was noted as the daughter-in-law of Richard Quelch. Clockmaker John Quelch was perhaps an uncle or great-uncle of Thomas Langley. Born into such a locality and apprenticed into such a family, we can only assume Thomas Langley himself was a committed nonconformist. 4. This view of the top plate shows the verge escapement layout and the later silencing switch. He would have finished his apprenticeship in 1681. Thomas Langley married Susan Fox on the 27th December 1684 at St. Helen's, Abingdon, the church with the largest nonconformist attendance - the other was that of St. Nicholas. Yet he did not take up freedom to trade in his own right till December 1687, when he was freed at Oxford. This may imply that he carried on working as a journeyman for John Quelch until 1687, as to do that he would not need the freedom. Thomas and Susan Langley moved to Stanford in the Vale, perhaps on the death of his father, who had been a 'mercer' there, that is a dealer in textiles. Thomas and his wife had four children baptised at Stanford: 1696 Sara, 1698 Elizabeth, 1700 Ann, 1701 John. There is a strange twelve-year gap between the date of the marriage in 1684 and the baptism of the first known child in 1696. Were they living elsewhere or was it simply they had no children for the first twelve years of their marriage? Then Susan must have died between 1701 and 1705, for he married there for the second time on the 8th Nov 1705 to Mary Smith. When he died seems not to be recorded, perhaps because he was buried in unconsecrated ground in some garden and not recorded by the local vicar. 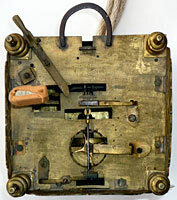 The lantern clock pictured here seems to be the only clock so far documented by Thomas Langley. This is strange for a man who seems to have lived for at least the best part of twenty years after qualifying as a clockmaker. Could it be that Thomas changed trades to take up his late father's business at Stanford as a cloth trader at some time after 1687 and before 1696? That would mean he was working at clockmaking in his own name only between 1687 and some time before 1696. That is one explanation of why his work is known through only one clock.